After I retired from being a consulting engineer my wife bought me a mosaics kit as a present. Eventually I got around to making the kit, and then another. Neither of us knew that this was to completely change my life, as by then I was completely hooked on mosaics. There followed a series of workshops and courses with tutors Sonia King and Emma Biggs at West Dean college. I started entering exhibitions after joining BAMM, CMA, Guildford Arts society (GAS), Cranleigh arts and crafts society. In 2014 my tiger mosaic won best in class at the GAS spring exhibition, and in 2015 three of my mosaics entered a creative cat exhibition in the "Your Cat " magazine and was one of the three winners with tiger, our cat moppet and a cat house number mosaics. Twelve years on and I have also started giving lectures and demonstrations combined to arts societies as well as teaching mosaics in workshops. 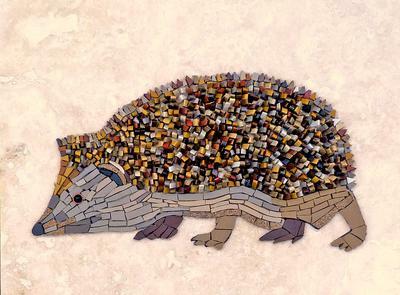 I just love everything about mosaics.